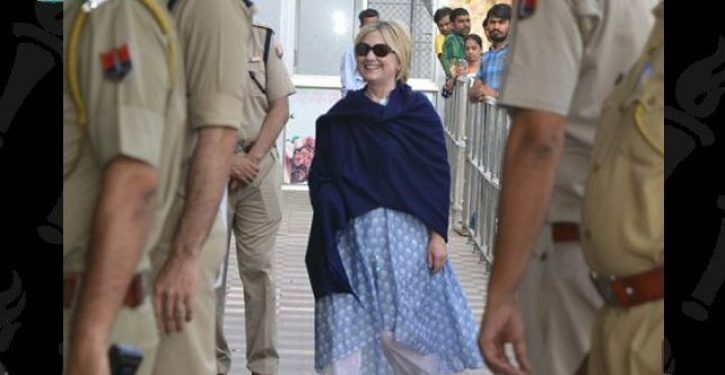 Clinton arrived to attend pre-wedding celebrations for Isha Ambani, daughter of Reliance Industries chairman Mukesh Ambani, Reuters reports. The wedding ceremony is Wednesday in Mumbai. Clinton’s husband, former President Bill Clinton, did not attend Saturday’s ceremonies but the two Clintons have a longstanding relationship with the Ambani family. The former president held meetings in India with Mukesh’s father in the early 2000s, according to Reuters, and Indian media reports indicate that the two Clintons have met with the Ambanis several times over the last two decades.